Britain's second-largest grocer will no longer stock Wii U consoles, accessories, or games in its 555 stores. More bad news for Nintendo's struggling Wii U console: a major UK retailer has stopped selling the system in its 555 stores. Asda, described by CVG as Britain's second-largest grocer, will no longer carry Wii U consoles, games, or accessories in its stores, though they will be available online "on a title by title merit basis." 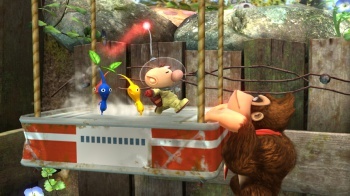 Despite the recent launch of long-awaited title Pikmin 3, the retailer didn't stock the game. While the Wii U's dismal sales might help explain why Asda would suspend the console's sales, it's also no longer stocking 3DS systems online. Unlike the Wii U, Nintendo's latest portable has been on fire recently, with the launch of Animal Crossing: New Leaf sending stock soaring to a two-year high. Asda is still selling PS3, Xbox 360, and Vita systems in stores, as well as games for all three, and plans on stocking the Xbox One and PS4 later this year. "Nintendo UK does not comment on specific business practices with individual retailers. However, as we have seen with Nintendo 3DS, software sells hardware, and with titles such as Wonderful 101, Legend of Zelda: The Wind Waker HD, and Super Mario 3D World already announced for this year as well as the recently released Pikmin 3 and New Super Luigi U having reached number 2 and number 6 in this week's chart respectively, we are looking forward to the year ahead on Wii U." Nintendo is right about one thing: software is needed to move hardware, and the Wii U has been sorely lacking worthwhile games. This holiday season has potential, and next year's releases of Mario Kart 8 and Super Smash Bros. could help Wii U sales pick up. Of course, that's probably not reassuring for Wii U owners, who have waited a long time for launch window and first-party games that have been repeatedly delayed.